Scotsman has continued in its quest to develop a range of icemakers using only natural refrigerants by adding the MXG gourmet Supercube icemaker range to its EcoX collection. Available from Hubbard Systems, the range’s three models, the MXG 327, MXG 427 and MXG 437 fully comply with the F Gas Regulations, and have almost zero impact on both ozone depletion and global warming potential. They are modular units that have been designed to sit on top of a separate ice storage bin. In addition to their green credentials, the three MXG models offer high volume ice production rates from compact bodies. Even the largest model, the MXG 437, measures just 568mm wide by 704mm deep and 721mm high, yet can produce 195kg per day. The smallest capacity model, the MXG 327, can produce 152kg per day. Gourmet Supercubes are one of the traditionalist’s favourite ice cubes for drinks’ presentation. Their ice is crystal clear, while the consistent thimble shape and slow melt make them the natural accompaniment for any on-the-rocks drink, where looks, lack of dilution and effective chilling are key. 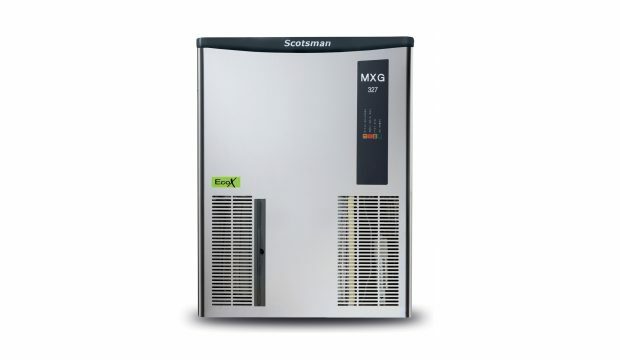 The addition of the MXG series to Scotsman’s expanding EcoX range brings the collection to 27 models. The focus of the range has centred on providing operators with a wide selection of climate conscious, market leading options. In total, there are 12 small and medium production level models, 13 high production appliances and 2 dispenser units in the EcoX range. Hubbard Systems offers a selection of ice bins that are compatible with the MXG range.